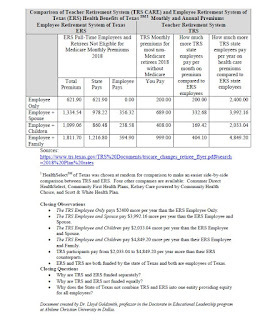 February 10, I filed a Public Information Request with the Teachers Retirement System of Texas after seeing their “2016 Benefit Distribution” chart in TRS: A Great Value for All Texans, published in February of last year and made available at the TRS Board meeting held at the University of Texas Rio Grande Valley last month. (Although I could go on for hours about the title of this booklet, I won’t.) Every time I look at that chart, my emotions run the gamut, from sadness to disbelief to frustration to outrage. How could Gov. Greg Abbott, Lt. Gov. 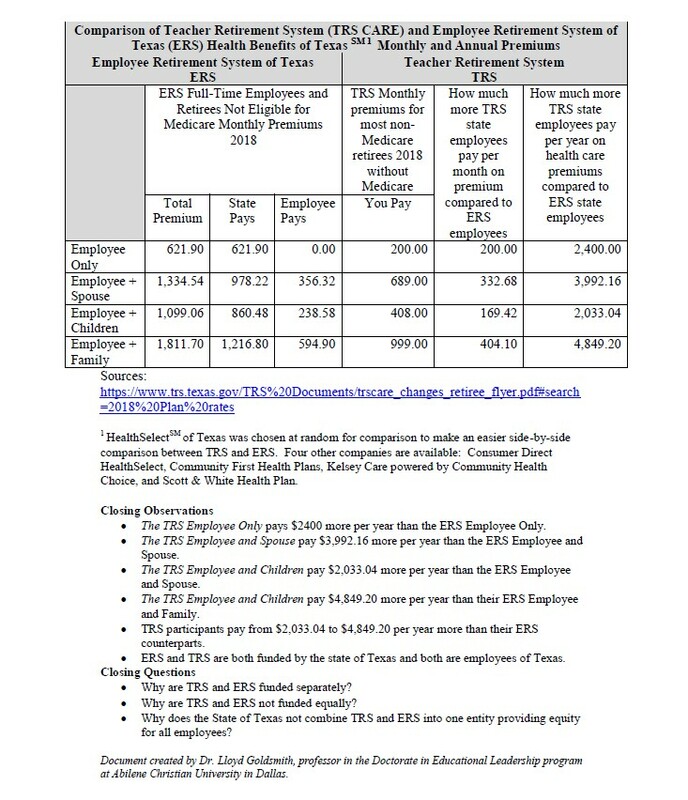 Dan Patrick, most members of the Texas Senate, and several members of the Texas House create a healthcare nightmare for retired public school employees across the state when 32 percent of those employees earn a pension of just $1 - $1000 per month after years of service to public school students in our state? I attended the final day of the TRS Board’s meeting in Edinburg and testified during the public-comment period that day. Following my testimony, Dr. Greg Gibson, Superintendent of Schertz-Cibolo-Universal City ISD and a member of the TRS Board asked Brian Guthrie, TRS executive director, for the average monthly pension for a TRS retiree, to which Guthrie responded, “$2,046.” But when I read the chart in that booklet, I couldn’t imagine how much my friends and former coworkers who, prior to retiring, held positions paying less than a teacher’s salary must be making now, in retirement. I wanted to see a breakdown, by profession, so in my PIR, I asked for the average monthly pension for our retired school custodians, secretaries, bus drivers, cafeteria workers, and maintenance workers. I don’t know how our retired bus drivers survive on $367.70 per month, let alone how they could even begin to afford their healthcare after January 1 when the 2017 Texas Legislature’s TRS nightmare went into effect. Something else crossed my mind. Why DOESN’T TRS “capture the position the retiree held at the time of retirement”? Have members of the Texas Legislature never asked this question? What does the overall average matter when you have a subgroup earning $367.70 per month and others perhaps making even less? Keep in mind that, according to the Texas Retired Teachers’ Association, 95 percent of TRS members do not pay into Social Security, and this is not by choice. Most Texas school districts do not allow public school employees to do so. And those of us who have worked jobs outside of teaching to earn extra money, although we must pay Social Security the same as anyone else, we are unable to receive most of that money back due to two federal laws—the Windfall Elimination Provision and the Government Pension Offset. We are forced to pay at the same rate as others, but because we receive a pension, we cannot get our full SS benefits in retirement. Thus, according to TRTA data, for most TRS retirees, the monthly pension is their only source of income in retirement. 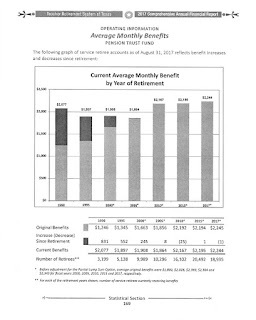 In the response to my PIR, I also received an Average Monthly Benefits graph. 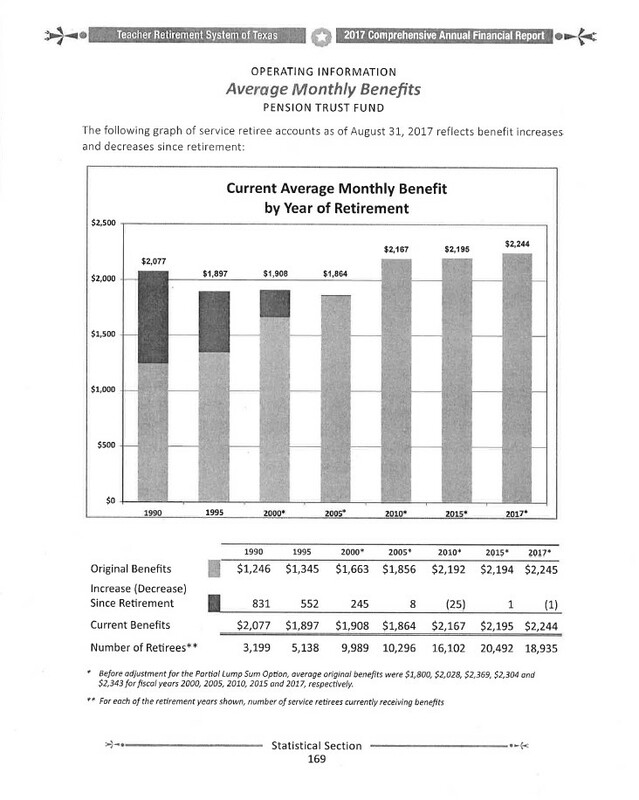 That graph indicates that the average TRS retiree earned a monthly pension of $2,077 in 1999 and of $2244 in 2017. (I do realize this contradicts Guthrie’s response to Dr. Gibson’s question at the hearing, but this is what the graph shows.) According to the Bureau of Labor Statistics, prices in 2017 were 46.9 percent higher than prices in 1999. Meanwhile, in Texas, public school retirees have seen an 8 percent increase in their pensions in that same period of time. Now he says this? Now, after under his “leadership,” the 2017 Texas Legislature increased the deductible for TRS retirees from $400 to $1500, with the plan not paying a cent of our healthcare or prescription coverage (except a list of standard generic drugs) until we pay the entire $1500 out of pocket? And for married couples covered on TRS healthcare, they must pay $3000 out of pocket before a single penny is paid. This is what Abbott, Patrick, and several members of the Texas Legislature did to retired school bus drivers earning an average of $367.70 per month, to secretaries, to custodians, to teachers, to nurses, to maintenance workers, to librarians, to cafeteria workers, to classroom aides, to administrators, and to all other retired public school employees who spent our careers serving the children of this state believing in the delayed benefit of affordable healthcare. And don’t forget---they did this while keeping retired legislators and all other retired state employees on a plan with NO DEDUCTIBLE for healthcare, NO MONTHLY PREMIUM, and a $50 prescription deductible. And those retired legislators, the “elected class,” get this far-superior healthcare after serving our state for just eight years if retiring at age 60 and just 12 years if retiring at age 50. They are covered under the state’s other pension system, the Employees Retirement System of Texas or ERs. The words of Scott Milder, a Republican challenger for Patrick’s lieutenant-governor seat, in a forum at Grayson College yesterday, is music to my ears: The first thing I’m gonna do when I get into office is I’m gonna make a move to transfer all legislator insurance from ERS over to TRS. Yeah, and we’ll see if maybe that might provide some PERSONAL incentive to take care of our teachers and to do what’s right for all educators in the state of Texas. If you haven’t voted yet, please join us and vote for public education and public education employees Election Day, Tuesday, March 6. Created by Dr. Lloyd Goldsmith, professor in the Doctorate in Educational Leadership program at Abilene Christian University in Dallas. Watch the Lt. Governor and Senate Seat 30 Texas Candidate Forum March 1, 2018, at Grayson college by clicking here. Hear Scott Milder's response that I quoted above beginning at 53:50. I'll believe this when there is a difference in the bottom line of my annuity! We've heard so many broken promises in the past, who is going to believe what this go round is going to be any different. We need a class action suit. 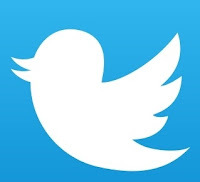 Class action lawsuit or mass teacher walkout! I desperately need the benefits from social security or widow benefits from my husband. Working as a secretary for 20 years does not cut it. 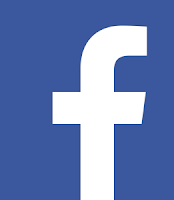 I am 61 yrs old and may have to find another job.